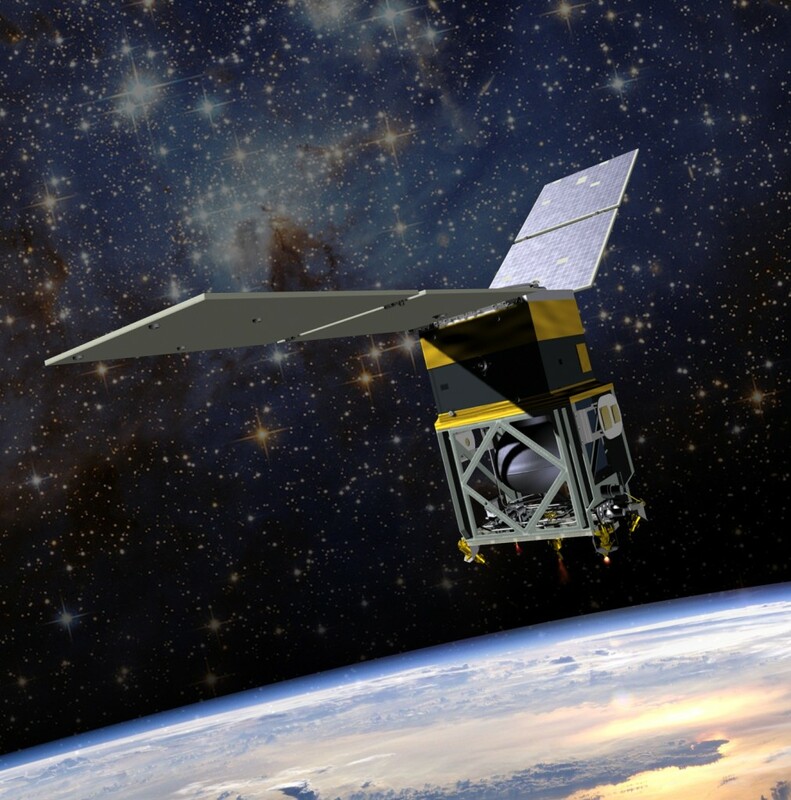 Artist rendition of NASA’s Green Propellant Infusion Mission (GPIM) that will demonstrate and test the capabilities of a high-performance, non-toxic, “green” fuel on orbit. Image Credit: Ball Aerospace & Technologies Corp.
October 5, 2015 – Ball Aerospace, prime contractor for NASA’s Green Propellant Infusion Mission (GPIM), has integrated the propulsion subsystem onto the BCP-100 spacecraft bus and begun system performance and environmental testing as the project heads toward a 2016 launch date. The Green Propellant Infusion Mission aims to revolutionize spaceflight by demonstrating improved overall propellant efficiency while reducing the toxic handling concerns associated with the traditional hydrazine propellant. The Ball-led validation mission, will characterize the green fuel’s performance on orbit during a 13-month mission that also hosts three experimental payloads. The Aerojet Rocketdyne-provided Green Propellant Propulsion Subsystem was delivered to Ball Aerospace in August and was integrated onto the Ball Commercial Platform (BCP-100) spacecraft bus in less than two weeks. Prior to launch, the subsystem will be loaded with a non-toxic propellant called AF-M315E, developed by the Air Force Research Laboratory. In addition to a simplified launch process for future spacecraft, the GPIM technology offers increased payload space and longer mission duration. GPIM is the third build of the BCP-100 spacecraft bus. Roughly the size of a mini refrigerator, the BCP-100 can host a minimum of four independent payloads and demonstrates the ability to rapidly access space by using standard interfaces on a standard spacecraft bus. In addition to the Green Propellant Propulsion Subsystem, three Department of Defense (DoD) Experiments Review Board (SERB) experimental payloads will fly aboard GPIM. Two of the three payloads previously flew on the Ball-built STPSat-3, which launched in 2013. This is the third time Ball has integrated DoD (SERB) payloads to the BCP-100 platform. The SERB chooses experiments based on a high potential to provide new or enhanced warfighting capabilities for the DoD. Payloads are designed to be compatible with the spacecraft bus, resulting in lower spacecraft non-recurring costs, shorter acquisition timelines, decreased spacecraft build costs, and increased spaceflight opportunities. GPIM is sponsored by NASA’s Space Technology Mission Directorate. In addition to Ball Aerospace and Aerojet Rocketdyne, the team includes the U.S. Air Force Research Laboratory at Edwards Air Force Base; the Air Force Space and Missile Systems Center at Kirtland Air Force Base, New Mexico; and three NASA field centers: NASA’s Glenn Research Center in Ohio, NASA’s Kennedy Space Center in Florida, and NASA’s Goddard Space Flight Center in Maryland. The Technology Demonstration Missions program office at NASA’s Marshall Space Flight Center manages GPIM.